It doesn't hit home until you're standing there, eyes fixed on the old man of 87-years old. He is no longer cognisant of his surroundings, I am told. His ability to register familiar faces and places is no longer as keen as before. He can barely recognise his own son who is standing beside me at the side of his bed on the day we paid him a visit. First a boat-builder — during the Japanese occupation — and later a plumber, his hands were the only means by which he made a living and raised a family. Now, with children all grown up with families of their own, he is bedridden, immobile and has to be cared for in a nursing home. Alzheimer's has set in, along with Parkinson's and coronary heart problems. His son and daughters, in their 30s and 40s, try their best to provide the care he needs. They had him at home in the beginning but as his needs grew, they had no choice but to put him in a nursing home. It was no longer viable or practical for the siblings to provide the special care he required. So in 2007, they decided to seek the services of a nursing home. Several months ago, they were told that their father had had a fall in the home. On further probing they realised that the home had not been totally truthful about how this had happened. They were initially told that the incident took place at about 6 or 7pm. The family was informed at 8pm. However, they later discovered that it had actually happened at 2pm. They were upset that it took the home 6 hours to inform them. In the meantime, the family was having problems paying for their father's stay in the home. It came to more than S$2,000 a month. Further enquiries with other homes revealed that they were all fully booked. In any case, they were not much cheaper either. In addition, the siblings too had to provide care for their mother who is wheelchair-bound and suffers from various ailments as well. The family was at its wits' end. They finally had to consider the one thing they never thought they would have to — to place their father in a nursing home abroad as it would relieve the financial burden in caring for both parents. After a search of the Internet for nursing homes in Johor Baru (JB) in Malaysia, they shortlisted several and finally decided on one. The siblings paid a visit to the home earlier this year and made the decision to place their father there. It would cut their financial obligations by some 60 percent, not an insignificant amount for the siblings who aren't financially well-off. "No one wants to have their father in a nursing home abroad," the son tells me, his voice quivering. "But we have no choice. The costs in Singapore are just too much for us." The consolation he and his sisters take from this is that the home is set in a quiet neighbourhood, in landed properties which are converted to homes, giving a certain familial warmth to the elderly residents. It is located about 40 minutes by taxi from central JB. The staff there too are friendly and compassionate. When the son enquired about making bank transfers so that payments could be made on time, the person in charge, Ms Suraya (not her real name), of the home repeatedly tells him not to worry. "It doesn't mean that you have to pay on the date we agreed on. It is okay if you are one or two weeks late. It is okay," she tells him. Such compassion gives the family some peace of mind. We were told that in recent months, more Singaporeans have made enquiries with the home. "The main reason is the cost," Ms Suraya says. "But also the recent case of abuse in a nursing home in Singapore has raised concerns among Singaporeans." She was referring to the Nightingale nursing home at Braddell Road where the staff were discovered mistreating a resident there. The JB home currently has 20 Singaporean residents. Demand has been so strong that it is planning to open a new center in the coming months. As we took our leave of the home, another elderly resident waves at us. "Young people like you, good," he said, pointing his finger at us. "Old people like us, no good anymore." It was something he keeps repeating during the next few minutes we conversed with him. On the next bed beside his was a Malaysian, who is no older than 55. "I am Malaysian but I had been working many years in Singapore," he said. "My children all were born in Singapore and are still there." He recently had an accident which broke several of his hip bones. When we asked why he was there and not with his children in Singapore, he said they could not afford the cost of putting him in a nursing home in Singapore. As we left them and the home, I wonder how many Singaporeans — after having served and contributed to the country — would end up in homes such as this one abroad simply because they would not be able to afford to stay in nursing homes in their own country. It is just not right that our elderly, in what should be their golden years, are subjected to this indignity, to be cast aside or forced out of the land they were born in, grew up in and worked for and contributed to, through no fault of their own or their families' — with the prospect of returning home only when they have breathed their last. 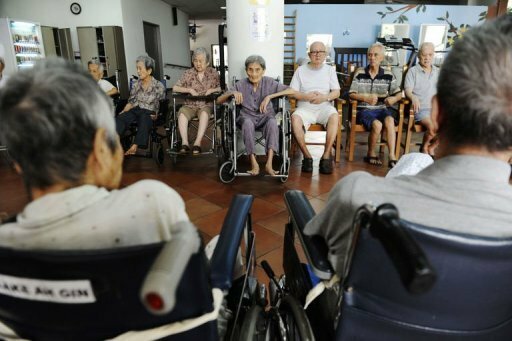 With almost a million Singaporeans projected to be above 65-years old in 2030, it is incumbent upon the government to seriously look into this matter and not let our elderly be subject to such unconscionable indignity when they are no longer "economically active." There is a responsibility for a government to care for those who no longer can, and to extend help to families who are burdened in such circumstances. Our elderly should not have to seek shelter in a foreign land. They are as much a part of us as those who are rich, economically active or young. Our country should not and must not abandon them to another country. It is our responsibility and we must not shirk this.